Mount Anthor is a mountain southwest of Winterhold and west of the Shrine of Azura. This dragon lair is inhabited by a level-dependent dragon. There is an alchemy lab on the altar in the middle of the lair, one urn, and one burial urn. At the top of the main stairway in the center of the lair is a word wall which teaches part of the Ice Form shout. Before completing Dragon Rising, this location is home to two leveled warlocks. Mount Anthor is the only dragon lair with no treasure chest. Mount Anthor was the site of the battle between Olaf One-Eye and the dragon Numinex which occurred during the First Era. 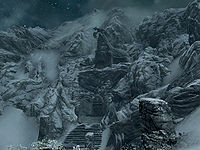 The path southwest up the mountain to the lair continues to the south, then east, looping back to the Shrine of Azura. It appears that the dragon caught a party of refugees in the open on this path. Their three bodies, along with a wrecked cart piled up with their belongings, can be found partially buried in the snow. Among the detritus are a few useful items: a coin purse, an apothecary's satchel, a leveled battleaxe, and a copy of the Enchanting skill book Enchanter's Primer. Mount Anthor also appears in Legends. If the dragon at the wall is the subject of a bounty, it may not appear after the main quest has been completed. Sometimes after killing the dragon, you won't absorb its soul. You may also be unable to harvest Dragon Heartscales with Kahvozen's Fang. The dragon sometimes doesn't spawn correctly. This causes the compass to point towards Markarth with the map pointing to the "correct" location. If you follow the marker into Markarth, it changes to the bold arrow and points toward the correct location, thus insisting your objective can be reached from inside Markarth. Try console commands "prid 32AC2" and "moveto player" to have the dragon appear. You can confirm the correct id by checking the quest variables. You can also skip the quest by using the console command "setstage BQ04 100", or "setstage FreeformSkyHavenTempleB 100".